Even if a charge has been leveled against DC Comics's Rebirth initiative that it's over-fond of what came before without moving forward, it's hard not to be taken in by the warmth with which James Tynion embraces this old material in Batman: Detective Comics Vol. 3: League of Shadows. This is an Orphan Cassandra Cain story, nee the No Man's Land-era Batgirl; there's not much Tynion does that's new with her, but at the same time it's been a while since we've seen a writer delight so fully in the Kelley Puckett take on the character. If Tynion is singing old songs, he's singing them well, and with gusto. 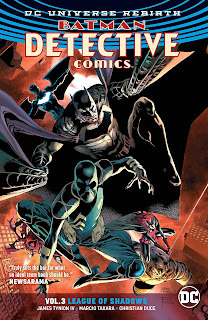 Further, Tynion's Detective Comics remains an excellent team book, especially in the interaction between Batman and Batwoman, and Tynion's fraught plots kept me turning the pages well into the night. At some point in Cassandra Cain's history, when Kelley Puckett gave way to Dylan Horrocks and Andersen Gabrych and Adam Beechen, I think there was a perception that the taciturn Batgirl was too hard to write, and little by little she gained the ability to speak. James Tynion, as James Tynion does, reels us back to the first, most recognizable version of this character, the one who barely understands words but who can "read" people through their body language. And so Tynion takes us through it, recounting what most Cassandra Cain fans already know, including that Shiva is Cassandra's mother; I think we've even seen this ballet bit before. But again, Tynion's characterization of Cassandra is pitch perfect (better, most likely, than anyone but Puckett) and his esteem for the character obviously so high that I'm glad to sit through what I've seen before (much more than I was Action Comics's re-hash of the Superman/Doomsday fight). And it helps too that Tynion has a multi-faceted team book where almost everyone's got a storyline, plus a revolving door of character cameos such that you're never sure who's going to show up next. Of note here especially is Tynion's dilemma for Clayface, whose troubles seem to essentially boil down to deciding in which bad manner he wants to die; Tynion writes here the most interesting Clayface has ever been, ever. As with Cassandra, Tynion also distills Azrael Jean Paul Valley down to his best version, and I'm very curious to see if Tynion riffs on any of the early Dennis O'Neil/Barry Kitson series in his forthcoming spotlight on Azrael (one also has to love Azrael and Batwing Luke Fox as "science bros"). That each team member has their own thing going on and that these B- and C-plots are slowing growing into A-plots one at a time makes for the kind of immersive storytelling sorely lacking in these comics with just the hero in focus all the time and barely any subplots. And that immersiveness is only enhanced by "smaller" characters like Harper Row and Ulysses Armstrong floating around the edges. Equally I continue to be enamored by Tynion's depiction of Batman and Batwoman as the leaders of this team. This really is the first time in my long memory that we've ever seen Batman treat another Bat-hero like anything close to an equal; Nightwing has never had the kind of say-so with Batman that Batwoman has. Also, Batman's early suggestion that he and Batwoman take Cassandra to the ballet in their civilian identities is a thunderous moment, under-played; when was the last time Batman was enough of a mentor to consider a social outing with one of his prodigies for their mental well-being (answer: never). Further, Tynion suggests Bruce Wayne as a ballet fan; all too often I think writers depict Bruce as solely an act and no real part of Batman, when based on Bruce's standing, early upbringing, and even his role as the world's greatest detective, it's only logical that he'd be cultured, probably especially in something like the fine arts. It only remains problematic that here, as in previous volumes, Tynion still needs Batman to be speaking out of both sides of his mouth. Late in the volume (in a short story from Detective Comics #950, moved from the beginning of the book to the end), we see how Red Robin Tim Drake had confronted Batman about his various machinations to position Nightwing, Red Hood, and Robin Damian Wayne here and there, in preparation (the narration tells us) for "Dark Days" and Dark Nights: Metal. I suggest no conspiracies or backroom unhappiness, but it does seem Tynion's Batman acts one way in the main story, altruistically, and then another way in the Metal lead-in, unscrupulously using his proteges without their knowledge, and one wonders if this suggests a dichotomy between what Tynion needs for his own story and what he needs for others'. I was sorry not to see much of artist Eddy Barrows on Batman: Detective Comics Vol. 3: League of Shadows, but I thought for the most part the team of artists did nicely (though there's perhaps a few too many artists here for comfort). There's about never a time I don't want to see Fernando Blanco's work, and it's welcome here to anchor the book's middle. I don't know where Alvaro Martinez has been all my life, but his Azrael short story displays work on par with Jim Lee and Jason Fabok, and I'm pleased to see him sticking around for the Azrael arc. Christian Duce brings some nice realism a la Gary Frank, and Marcio Takara depicts the loftier ballet scenes in the beginning well, only drawing some of the serious stuff a bit too abstractly later on. Once again a great volume; James Tynion's Detective keeps its place as one of the first books I read when the next trade comes around. I only just got this book today and it lived up to the standards I've come to expect from James Tynion IV. The first issue focusing on Cassandra Cain was just beautiful, the growth characters undergo in his books are something you don't see a lot of these days. It also restored Ra's Al Ghul back to the kind of enemy he's supposed to be. The only thing that I don't get is why they moved the backup stories from the first issue to the end. The prayer joke from Batwing at the end of the main story was based on the first of the 2. I personally hope That Shiva her last words (well hopefully not last) to her daughter were something about Richard Dragon, I really want him back into continuity (I know he's supposedly dead, killed off page by a lousy b-grade villain of Green Arrow.). But sadly that probably wont be the case. But as usual this book told a great complete story and at the same time you know it's just a small piece of the puzzle. While the current Flash/Supergirl books are at the lowest end of quality we have post-Rebirth(that I've read so far), this and Wonder Woman have been at the top. Certainly the best Batman series in a long time.